We've talked a little about how the games are recorded in chess rules. I will elaborate on this subject in the following article. 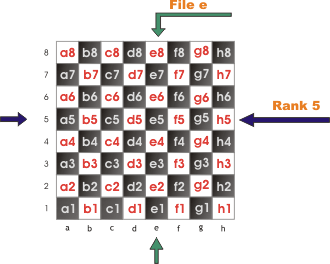 There are a great deal of ways to record chess games. We will only talk about a few; just enough to get you started as a beginner. Writing down the moves in official games is a 'must do'. Usually the contestants are given a special piece of paper on which to write their moves, but when that is not possible they just use a regular piece of paper. A move is registered by first indicating the square from where the piece lives and then the destination square. Then all there is to do is to indicate which piece is being moved. Although the move is completely determined only by indicating the destination and the square from which the piece leaves, by specifying the piece which is being moved the reader can go through the game much easier. There are experienced players who can follow a game form beginning to end only by reading the notations and visualizing the board and position. Let's watch the following game so you can get a better idea. 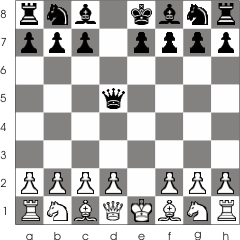 White moves the pawn in front of the king two squares. This is indicated by e2-e4. Black responds by moving the pawn in front of the queen d7-d5. The complete move is written like this : 1. e2-e4 d7-d5, where the number '1' indicates when the move occurred; in our case this was the first move. The second move White does is to capture the pawn from d5 e4:d5, and Black responds by capturing the white pawn with his queen Qd8:d5 . The ':' sign indicates that the piece on the square written after it is captured. Let's go further in the game : 3. Nb1-c3 Ng8-f6 4. 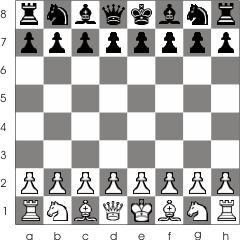 Bf1-b5+ .The '+' indicates that the king was checked. 4. ...Nb8-c6. You will find this kind of notation (the '...' sign) in different publications. They usually come after the author makes a comment on White's move, just like I did when I said "The '+' indicates that the....." . 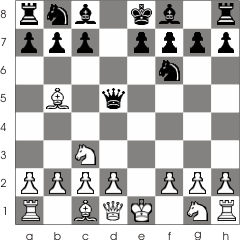 You may have noticed that there is no "P" in the case of pawns moves. So, when you won't see any letter you will know that is a pawn move. The notation you've seen here is called algebraic notation and it's widely used in many chess publications. There is also another notation you should know about : the abbreviated algebraic notation. This is just like regular algebraic notation with the difference that the square from which the piece leaves is no longer written. 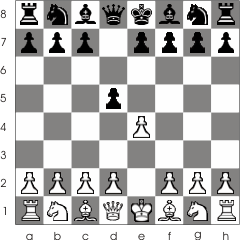 The moves above look like this in abbreviated algebraic notation : 1. e4 d5 2. e:d5 Q:d5 3. Nc3 Nf6 4. Bb4+ Nc6. In some situations when on the destination square could be moved more then one pieces at the notation is added extra information so you can determine exactly which piece went on that square. It is a good practice if you start to write down the moves. In this way you can go over your game later on and see where you or your opponent made mistakes. Also if you are planning to get very good at this game and you may play on some official game (you never know when this might happen!...) you should start from now to learn how to record your game. Here are some symbols used throughout this site and in many publications. Some of this symbols express the importance of the move. There are other notations but for now these are the only ones you need to know.